We will ride as a group to the Texas Capitol and visit every legislative office – all 181 of them! At the end of the day we will re-gather to socialize. We want you to be part of this special day. Please register to receive event updates and help us plan our day of visiting our elected representatives. The dress code for this event is business attire. Come dressed for business! 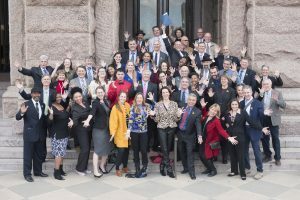 It strengthens our image at the Capitol when people who ride bikes wear suits or similar professional attire while lobbying elected officials for better laws and infrastructure. There will be lots of walking on lobby day, so be sure to wear comfortable shoes. We will have extra bike parking at the Capitol for the day, but please bring your own lock for your bike. Lunch is on your own. The Capitol Grill will be open and a wide variety of dining options are located within a few blocks of the Capitol. Check out our Facebook event page for discussion regarding the event. A bus is planned for DFW-area participants who need a lift. A block has been reserved at Hostelling International for travelers needing affordable accommodations. We will have a brief orientation at 8:30 am and then, weather permitting, we will ride as a group to the Texas Capitol. Plan to bring your own bike if at all possible. Several bikeshare companies operate in Austin, so if you can’t bring your own bike, it is easy to rent a bike for the ride. Please email us right away if you are unable to ride due to physical limitations, so we can arrange transportation from our morning gathering to the Capitol.